No. 6, Jalan 2/2, Taman Industries Selesa Jaya, 43300 Balakong, Selangor, Malaysia. 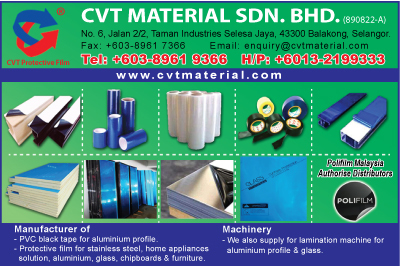 CVT Material offer various type of product specification, materials base properties, various type of adhesive and different dimension packaging to meet the industrial requirement. The protective film is a layer or multi layers of thin but strong and very flexible formulated insulator, it capable to protect the surfaces of “in the process” material and also widely use to protect the surface of finishing products. The protection film have many advantages such as; remarkably thin & lightweight, very flexible to form & matching the shape of different surfaces (flat, round, curve, contour & etc) easy to apply, clean and removable with no residual. If you are looking for the most simplest protection layer to prevent your product from unnecessary handling scratches, stress, dust, dirt, paint, liquid & chemical splash, contamination & etc You are in the right place, our products range are covering all kind of material surface protection. If you have any question please do not feel hesitate to contact us. We are confident of meeting the needs of today’s industries with reliable & competitive cost.